Incredibly friendly and welcoming A place I highly recommend to go. We were there in September 2013 (I know it's a bit late to write the review now) and Abdull was just the best ,host, to have. The breakfast was absolutely lovely, the ambiance also thanks to Abdull and the very characteristic furniture and decoration! The place to be in Marrakesh! Fantastic place Really great experience. The staff were so courteous, helpful, and accommodating. The riad (hotel) was beautiful, quiet, and well maintained. Can't say enough good things. I would recommend this place to anyone. Great Stay I would recommend this place for budget travellers, the room was very clean and some of the staff was very friendly and accommodating. There is a very nice roof top terrace to hang out on. The internet didn't work at times. Great riad, very close to the main square. 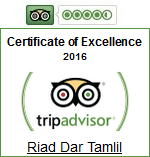 Staff were very accommodating, the room was comfortable and had air-con, and the breakfast was lovely. Just a really nice place ro stay, beautiful!!! Not so easy to find but in the middle of the suks and still quiet! We had an absolutely brilliant stay here. The room was fantastic, with good air-conditioning and lovely features. The roof terrace was a great place to unwind and the staff could not have been more helpful. We were really grateful for all the advice they gave us on navigating and bartering in the Souks, as well as preparing lovely breakfasts, organising taxis and generally going the extra mile. Many thanks to Abdul and Riad Dar Tamlil, a truly fantastic holiday. Sehr zu empfehlen Schönes kleines Riad in der Nähe des Jemma el Fna, aber trotzdem ruhig in einer Seitengasse gelegen. Sehr nettes Personal, welches auch Flughafentransfers organisiert. Unser Zimmer hatte ein Doppelbett, war mit einer Klimaanlage ausgestattet und hatte ein Bad mit heißer Dusche und WC (recht hellhörig, da Vorhang statt Tür). Zimmer und Bad waren sehr sauber und wurden auf Wunsch täglich gereinigt. Das Frühstück war typisch marrokanisch (Tee oder Kaffee, Schmierkäse, Marmelade, Butter, Brot und wechselndes Gebäck), lecker und viel. Alles in allem sehr zu empfehlen, vorallem für den Preis. Great I had a great stay at the Riad here. Very close to Djema but like what everybody says, once you enter the riad it is a sanctuary. Quiet and peaceful. Clean rooms and toilets. Just that the drainage system probably needs some fixing because after a while the smell comes up. Great breakfast and I love love love their mint tea. I have to mention Abdul, one of the staff, he is very recommendable. He is honest, helpful and very polite. Very good communication skills too. Great value for money, I have to say! Such a nice place in Marrakech. Close to the centre but really quiet. Beautiful terrace and so good tipps for eating Tajine. Wonderful place to spend your time, enjoy fresh mint tea and Morocco-feeling. Oaza in chaotic city centre Great service, very helpful. The place has nice atmosphere. In the rooms you can feel like in the fairy tale. Such an attention to details. Sitated close to Djemaa el Fna, so you are in the middle of chaos, but when you cross the door to theis Riad you are in quiet paradise. Geweldig! Een plaats om lief te hebben. Dicht bij de Jama El Fna.Midden in het centrum en om je heen de bekende souks. Goede atmosfeer en in het voorjaar koele ochtenden en avonden.Prettig en behulpzaam personeel.